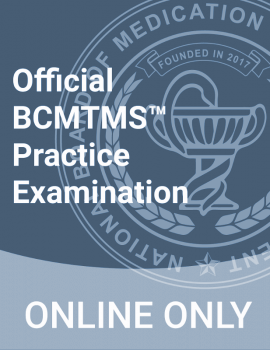 All candidates for the BCMTMS are required to read the NBMTM Code of Ethics and agree to a statement affirming adherence to the code when they submit their applications. The conduct of individuals certified by the National Board of Medication Therapy Management shall be consistent with all applicable local, state, and federal regulations, and with codes of conduct as established by the certified individual’s primary discipline. 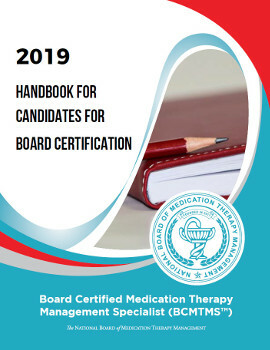 Additionally, individuals who are certified by the National Board of Medication Therapy Management shall be committed to increasing their knowledge in medication therapy management. All certified pharmacists must be responsible to determine that standards are applied evenly and fairly to all individuals who receive services. Certified individuals shall provide accurate documentation and timely feedback to members of the team, and other interested parties in order to assure coordinated, managed care. All reports will be objective and based upon an independent professional opinion within the Certified individual’s expertise. Certified individuals will provide only those services for which the individual is competent and qualified to perform. Certified individuals will refrain from providing services, which are counter to the ethical standard of their discipline. Certified individuals are obligated to maintain their education and competency such that it conforms to the standard of conduct both to the individual’s community, practice, and discipline. Medication Therapy Management is a coordinated multidisciplinary and interdisciplinary effort. Certified individuals will conduct their professional behavior so that it facilitates the services of all team members for maximum benefit of the patient. Certified providers shall maintain high moral values, ethics, and professional competence. They shall recognize the limits of their skills and license. They shall offer services consistent with the standard of their profession. Certified individuals have an obligation to accurately represent and disclose their training education, and experience to the public. Certified providers shall engage in continuing education. Certified providers recognize that the field of medication therapy management is developing rapidly and shall be open to evaluate and consider new products and approaches to medication therapy management. Certified providers should refrain from any activity which may result in harm to a patient without first considering alternatives to such an approach, seeking services which may achieve the same benefit without the associated risk, obtain consultations from other providers, and inform the patient of any risk inherent to any procedure or approach. Certified providers are obligated to safeguard information obtained in the course of their involvement with a patient. Information may be released with a patient’s permission; and circumstances where there is a clear and imminent danger to the patient or others: and where required by court or subpoena. The patient has the privilege to the extent feasible and practical, and those cases where there would be no legal or clinical contraindications, to see their chart when this can be arranged at a mutually convenient time. Certified providers will abide by all prevailing community standards. They will adhere to all federal, state and local laws regulating business practice. Competitive advertising must be honest, actual and accurate. Such advertising shall avoid exaggerated claims. Certified providers will not enter into any arrangement where fees are exchanged that would be likely to create a conflict of interest or influence their opinion about service rendered. Certified providers shall engage in behavior which conforms to high standards of moral, ethical and legal behavior. Certified providers will not engage in sexual contact with patients. Certified providers are encouraged to engage in research. In doing so, they shall have the safety of their subjects as a priority. Investigation shall be consistent with the traditions and practices of the certified individual’s discipline.